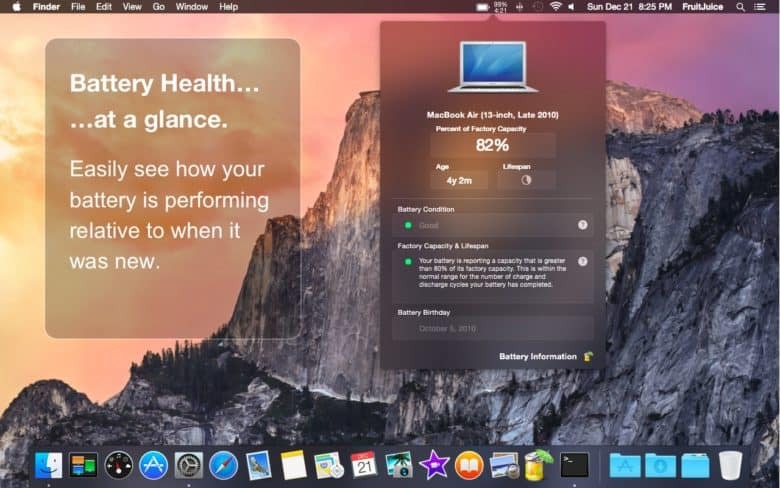 Looking after you MacBook battery is really easy. Did you know that leaving your MacBook plugged in all the time is a sure way to ruin its battery? That instead you should use your notebook computer on battery power for an hour or two each day? That’s the advice from battery health app FruitJuice, which will help you to keep your battery in tip-top condition. Just like you, your MacBook battery needs to take breaks throughout the work day. To look after your own body, I recommend Awareness, a free app that sounds a restful bong form a Tibetan singing bowl at regular intervals, to remind you to get up and stretch. I’ve been using it since 2014, and I no longer worry about RSI. 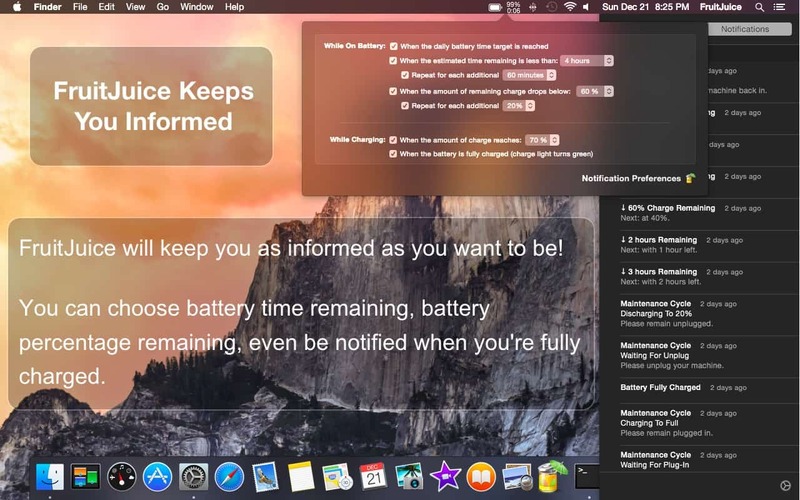 FruitJuice shows you how to look after your MacBook’s battery. For your Mac, you could try FruitJuice, which comes recommended by our Dear Leader, Leander Kahney. The app runs all the time, observing your usage patterns from its perch in the Mac menu bar. FruitJuice keeps track of how much time your MacBook spends charging, fully-charged, and running from the battery, and can show you this history on a chart, from the previous week’s worth, to the entire past year. 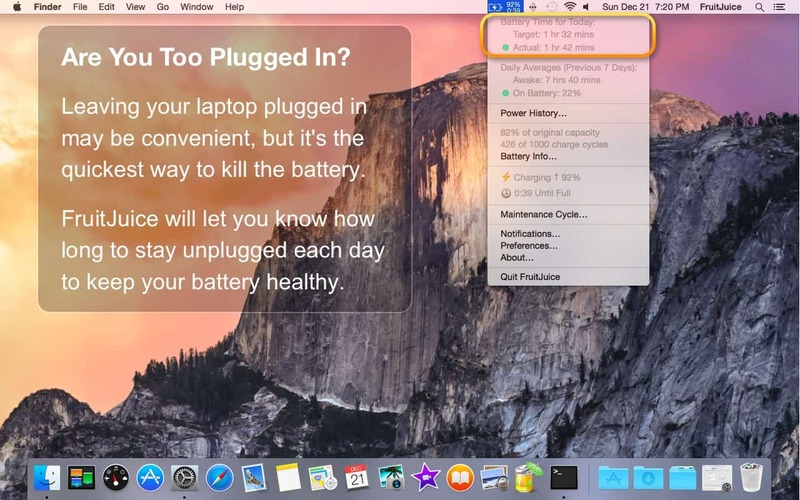 A previous version of Apple’s battery tips page recommended regularly using your MacBook on battery power. FruitJuice uses your usage patters to work out an optimum schedule for you to do this. It can’t reach around and unplug the cable by itself, so it uses Notification Center to send you alerts, instructing you when to plug and unplug the cable. FruitJuice notifies you when you need to unplug or plug in. If you keep to this schedule (and why wouldn’t you? It’s so easy), then you will probably never see FruitJuice’s other trick — the FruitJuice Maintenance Cycle. This instructs you to charge the battery fully, then run the MAcBook on battery until the charge drops below 20%. “FruitJuice will use the system Notification Center to walk you through the process and will let you know when you’re done,” says the FAQ entry. After running a maintenance cycle, you may see less maximum battery reported. That’s because the cycle allows the calibration to kind of reset, so it will report the true state of your battery. The capacity hasn’t actually dropped — it’s just now being reported more accurately. You don’t need FruitJuice to keep your battery in tip-top condition, but as it’s only $10, it may be worth it just to avoid the cognitive load of worrying about yet one more thing. The most useful part of FruitJuice, though, might be its charts, and the drop-down menubar sheet which shows you everything you might want to know about the battery, including its current capacity, and stats on your usage. In this way its similar to Coconut Battery, the Mac app that monitors your iOS devices’ batteries in much the same way, only without the reminders to unplug — as if you even need such a thing for an iPhone.